NeoGraft is advanced technology that automates the harvesting portion of an FUE (follicular unit extraction) hair transplant. This leading-edge technology for men and women assists tremendously in restoring a natural-looking hairline. NeoGraft gently removes the individual follicular grafts from the back of the head, also called the donor area. Each follicular graft may hold anywhere from 1 single hair to 6 hairs. Most people will start to worry about their overall appearance once they begin losing hair. This will, in most cases, have a direct impact on their self-worth. This is a concern that affects both male and female hair loss sufferers, and it is actually very common. Out of the entire population of the world, almost 85% of the male population and over 60% of the female population have or will experience some form of hair loss. The NeoGraft technology was introduced less than a decade ago as a handheld device that assists in the harvesting portion of an FUE hair transplant. This is the part of the procedure where individual follicular grafts are extracted from the donor area on the back of the scalp. 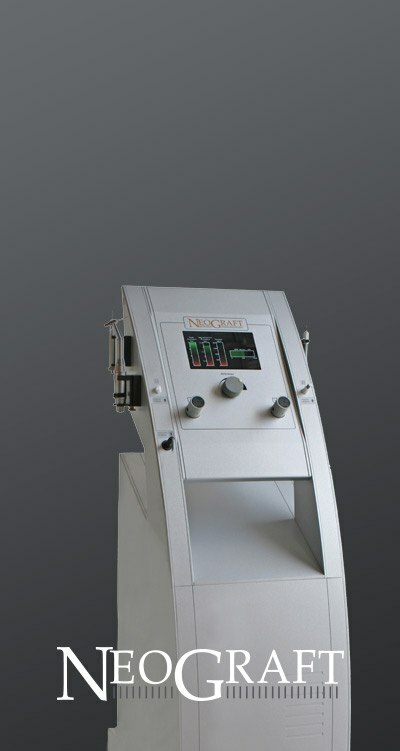 The NeoGraft technology harvests these follicles much more quickly and accurately than the former manual techniques, and the best part is that it leaves no visible scarring like the ones left from the previous FUT, or strip method, of hair transplantation. What are the benefits of NeoGraft? One of the most notable benefits of using NeoGraft for hair transplant procedures is that its accuracy assists doctors with harvesting superior follicles. The final goal for the patient is to restore hair loss and create permanent hair that grows naturally and can be cut or styled at the patient’s discretion. This has the ability to restore confidence and self-esteem. Many people have reported that their hair transplant has radically changed their lives and has dramatically improved their self-assurance. Hair transplant surgery in Toronto, when performed using the NeoGraft system, does not leave scars. In the past and even to this day, the FUT (follicular unit transfer) method would be used, where a strip of scalp would be surgically removed from the back of the head. After leaving the clinic, the patients had to face the further embarrassment of hiding the linear scar from where the strip was taken so it wouldn’t be apparent that they’d had a hair transplant. Once the area had healed, a scar was still left. Longer hairstyles work to cover up these scars, but a patient who decides to undergo an FUT hair transplant instead of an FUE hair transplant runs the risk of never being able to wear a short hairstyle ever again. An FUE (follicular unit extraction) procedure with NeoGraft not only leaves no visible scarring, but other than some redness and swelling for about a week, the fact that the individual has undergone this treatment is nearly unnoticeable. The expected outcome of a NeoGraft hair transplant when it is done correctly is to get a result that looks very natural. The hair is implanted according to the patient’s natural hair pattern. The harvested follicular grafts are strategically placed based on how many hairs are in each graft as well. Singles and doubles are used for the fine detail of the frontal hairline, and multiples are used to add density where it is needed. By choosing to have the procedure done using the NeoGraft system, patients are able to have a better result with minimal pain and downtime. Most patients feel completely healthy and healed within 3 to 7 days. This is a big advantage for patients who may be unable to take a lot of time off from work or stop participating in their regular daily activities. When is NeoGraft the right choice for you? There are many hair loss solutions out there today. Some of the most commonly discussed ones are PRP, TheraDome LH80 PRO laser cap, and SMP. However, these procedures do not replace healthy, thick hair naturally in an area that has lost hair. By using one or more of these treatments, there is a very good chance that you will be able to slow down your hair loss as well as help the healing process after your FUE hair transplant. A NeoGraft FUE hair transplant is one of your best options when it comes to repairing hair loss due to pattern baldness. By using the NeoGraft technology for your FUE hair transplant procedure, you are able to transplant healthy, permanent hairs and restore your hair in the areas where it has fallen out. The only thing that may hold you back is that you must have enough healthy donor hair at the back of your head to be able to replace the areas that are bald. The best part about the NeoGraft hair transplant procedure, especially for people with advanced hair loss, is that you can have it done multiple times over the course of your life. This is great for younger patients, because you no longer have to wait until you are bald before you can restore your hair using this FUE hair transplant procedure. You can start in the earlier stages of hair loss and do some preventative maintenance before things get worse. If you like to wear your hair short, then NeoGraft FUE is a good choice. An FUT (strip) method hair transplant will leave a visible linear scar in the donor area. The NeoGraft FUE process doesn’t leave any visible scarring. To determine whether you are a good candidate for a NeoGraft FUE procedure, contact the Toronto Hair Transplant Clinic today to schedule your complimentary consultation.